Sarah Houssayni was born in Beirut, Lebanon, she moved to upstate NY at the age of 25 to complete her training in Pediatrics. She lives in Wichita, Kansas where she raises two boys and is a clinical assistant professor at Kansas University. She has published Narratives in Family Medicine, Survive and Thrive, The Examined Life and Pulse Voices. She is a Writer’s Digest Award Winner for Personal Essay, this is her first book. 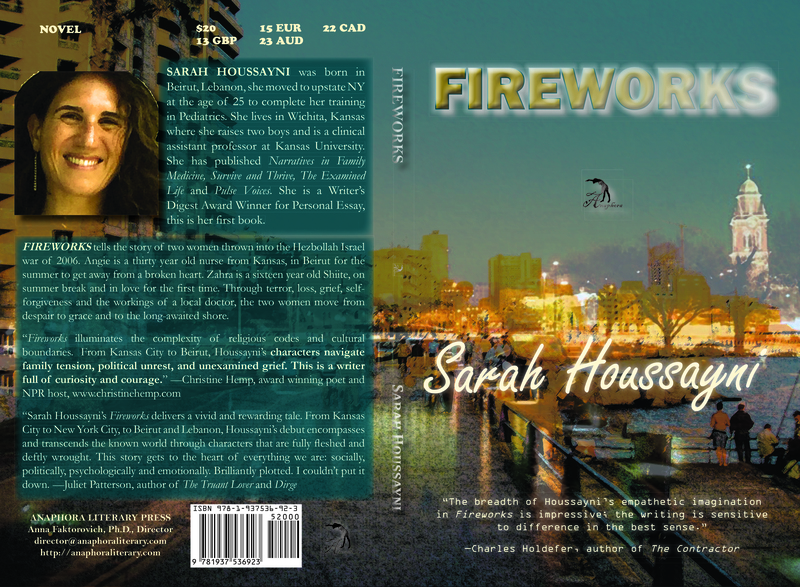 Fireworks: ($20, ISBN: 978-1-937536-92-3, Hardcover ISBN: 978-1-68114-121-3, LCCN: 2014954036, 6X9″, 180pp, February 27, 2015): tells the story of two women thrown into the Hezbollah Israel war of 2006. Angie is a thirty year old nurse from Kansas, in Beirut for the summer to get away from a broken heart. Zahra is a sixteen year old Shiite, on summer break and in love for the first time. Through terror, loss, grief, self-forgiveness and the workings of a local doctor, the two women move from despair to grace and to the long-awaited shore.